INAVSAT, a consortium formed joint- ly by Inmarsat, EADS Space Services and Thales, has been chosen as one of only three final bidders for the conces- sion to develop and run Galileo satellite navigation system, the European equiv- alent to GPS. The second competitive phase will now go ahead with the three consortia of companies on the shortlist. Undertaking (GJU), which originates from the European Space Agency (ESA) and the European Union (EU). Overlay Service (EGNOS). A major challenge faced by MARGAL is to pro- vide identical basic solutions to both harbors/ports and inland waterways in order to provide a harmonized seamless service for both sectors. MARGAL is now moving into the design and demon- stration phase with testing equipment placed along the Danube as well as in several U.K. ports. MPDS connectivity to maritime vessels of all sizes, from small fishing vessels and yachts to large tankers and cargo vessels. 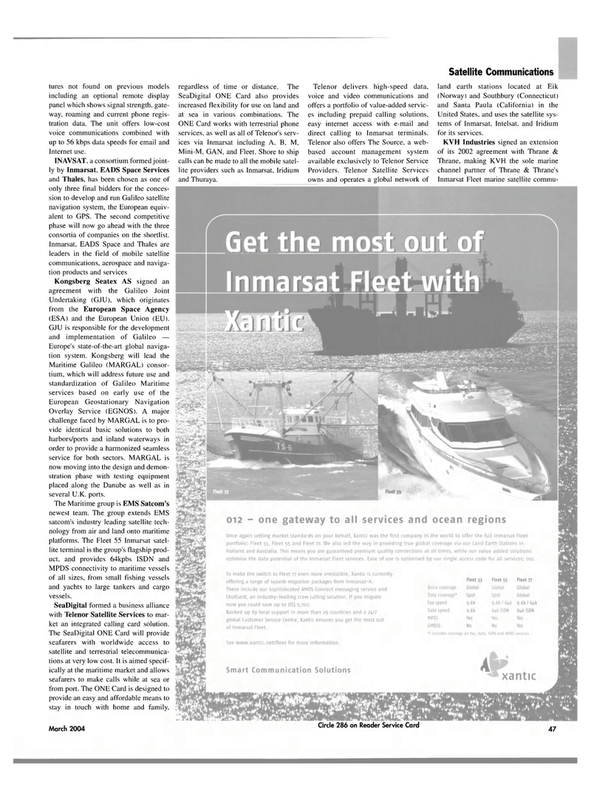 SeaDigital formed a business alliance with Telenor Satellite Services to mar- ket an integrated calling card solution. Mini-M, GAN, and Fleet. Shore to ship calls can be made to all the mobile satel- lite providers such as Inmarsat, Iridium and Thuraya. Telenor delivers high-speed data, voice and video communications and offers a portfolio of value-added servic- es including prepaid calling solutions, easy internet access with e-mail and direct calling to Inmarsat terminals. United States, and uses the satellite sys- tems of Inmarsat, Intelsat, and Iridium for its services.